MiniTemp MT2 and MT4 provide great ways to solve common temperature measurement problems, and are small enough to fit in your pocket! The popular MiniTemp MT4 also includes single dot laser sighting to assist with aiming. ST2 range it 0 to 525F (-18 to 270C), ST4 range is 0 to 750F (-18 to 400C). The ST PRO Series offers a broad temperature range and improved optics for measuring temperatures from a greater distance or measuring smaller objects from the same distance. Standard features also include a rugged rubber over molding, a durable plastic storage case, and Extra Bright laser sighting system. ST20XB range is -25 to 999F (-32 to 535C). The ST PRO Series offers a broad temperature range and improved optics for measuring temperatures from a greater distance or measuring smaller objects from the same distance. Standard features also include a rugged rubber over molding, a durable plastic storage case, and Extra Bright laser sighting system. ST60XB range is -25 to 1100F (-32 to 600C), the ST80XB range is -25 to 1400F (-32 to 760C). The CI measures target temperatures ranging from 0 to 500°C (32 to 932°F). The onboard electronics are protected by a rugged IP 65 (NEMA-4) stainless steel housing, allowing the sensor to function in ambient temperatures to 70°C (160°F) without cooling. With water cooling, the CI can withstand ambient temperatures up to 260°C (500°F). Type J, K or 0-5 V output. MI is a two-piece infrared temperature measurement system with a miniature sensing head and separate electronics. The miniature sensing head is small enough to be installed just about anywhere. Easily adjust the MI signal processing electronics, which include Emissivity, Peak Hold, Valley Hold, and Averaging functions, on the 5-digit LCD user interface. GP Series is a versatile, two-piece temperature monitoring system that combines a compact monitor and an infrared sensing head. The heart of the system, the 1/8 DIN GP monitor, provides advanced infrared processing capabilities including peak and valley hold and averaging. Available with standard or close focus optics. Emissivity is the measure of an object's ability to emit infrared energy. Emitted energy indicates the temperature of the object. Emissivity can have a value from 0 (shiny mirror) to 1.0 (blackbody). Most organic, painted, or oxidized surfaces have emissivity values close to 0.95. Some of our portable thermometers have adjustable emissivity to ensure accuracy when measuring other materials such as shiny metals. You can choose units with adjustable or preset to 0.95 emissivity. If you are using a thermometer with a fixed, preset emissivity of 0.95, and need to measure a shiny object you can compensate by covering the surface to be measured with spray oil, flat black paint or masking tape. Measure the temperature of the taped or painted surface. That is the true temperature. Please note, these tables are to be used as a guide only as emissivity changes with temperature and surface finish. Temperature sensors come in a variety of shapes and sizes, more than we could ever list on our web site. Any configuration to meet your application can be manufactured. Thermocouples and RTD sensors can usually be configured similar in the designs below. For your convenient we have listed several common sizes and configurations. Please contact us for your requirement. Information on types of thermocouples, their wiring color codes and temperature ratings. Straight Tip, Spade Terminals, Stainless Steel Tube. Many sizes available with braided and armor sleeving. Straight Tip, Plug Terminal, Stainless Steel Tube. Many sizes available with braided and armor sleeving. 90 deg. Bend, Spade Terminals, Stainless Steel Tube. Many sizes available with braided and armor sleeving. Fixed Bayonet Probe, Spade Terminals, Straight Tube. Many sizes available with braided and armor sleeving. Bayonet Probe, Plug Terminal, Angled Tube. Many sizes available with braided and armor sleeving. Adjustable Bayonet Probe, Plug Terminal, Straight Tube. Many sizes available with braided and armor sleeving. Nozzle Probe, Spade Terminals. Many sizes available with braided and armor sleeving. Extruded or Melt Bolt Probe, Plug Terminal. Many sizes available with braided and armor sleeving. Ringlet Fitting, Spade Terminals. Many sizes available with braided and armor sleeving. Brass or stainless steel shim stock thermocouple with stainless steel overbraid leads. Many sizes available with braided and armor sleeving. Refractory insulated thermocouple with flexible leads and spade terminals. Many sizes available with braided and armor sleeving. Refractory insulated thermocouple with terminal connector. Many sizes available with braided and armor sleeving. Clamp style with overbraid.Many sizes available with braided and armor sleeving. Thermocouple extension cable with Stainless Steel flexible armor and plugs on both ends. Any length available with or without plugs. Refractory insulated thermocouple with cast aluminum head. Many configurations available including explosion resistant terminal housings. Stainless Steel Thermowells in different lengths and thread sizes. Sensor heads for thermocouple and RTD assembles. Housing made of aluminum, cast iron and plastic for environments including general purpose, weather tight and explosion resistance. Brass Compression Fitting Adjustable Adapter (Brass compression fitting). Used for installing thermocouples, RTDs, or other sensors with metal tubular sheaths in pipes or tanks providing a torque-free, leak-proof seal. !/8" NPT. Bayonet Adapter Bayonet Adapter for any of the bayonet probes with standard locknut. Many length and thread configurations. Standard Connectors Made to standard industrial specifications for thermocouples and RTD's, thus allowing matting with other regular size plugs and jacks. Color coded based on sensor type. Mini Connectors Made to the standard industrial specifications in a mini size for thermocouples, thus allowing matting with other mini size plugs and jacks. Color coded based on sensor type. Panel-Mount Connectors For thermocouple and RTD's individual mounting into a 1 1/8" diameter hole (standard 3/4" conduit knockout). Installed entirely from the front of the panel. Cases are made of nylon (rated at 400°F). Color coded based on sensor type. Thermocouple Sensor Grade Wire THERMOCOUPLE WIRE- STANDARD GRADE meets or exceeds ISA (Instrument Society of America) specifications for accuracy. A variety of insulation is offered to meet your requirements. If the wire is to be used to run more than 20 or 30 feet, it is usually preferable to use the larger, more heavily insulated extension grade wire for distance runs. 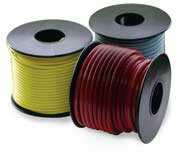 Available as a shielded wire and with stainless steel overbraid. Thermocouple Extension Grade Wire THERMOCOUPLE WIRE - EXTENSION GRADE is used mostly for connecting probes to instrumentation. To retard electrical losses along its length, it is generally larger wire and more heavily insulated than the standard grade wire. Available as a shielded wire and with stainless steel overbraid. Different gauges available. ©2006 Shuhart Company. All rights reserved.